This was supposed to be my final outdoor wedding of 2018, but temperatures in the low 50s moved the ceremony indoors. 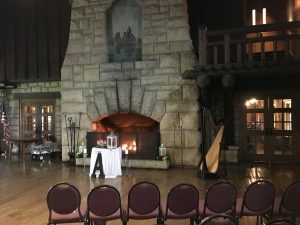 Much cozier by the fireplace at Pere Marquette! Close to St. Louis, it still feels a world away, and has beautiful views of the woods and the river. The bride and groom booked not just a harpist, but a harp, violin, and cello trio. 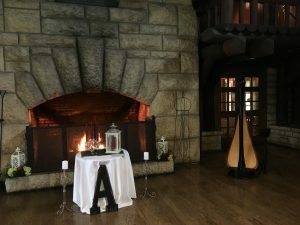 While solo harp music is beautiful, I also love working with my professional musician colleagues to create a unique musical experience for my couples. On this occasion, they even managed to keep their ceremony music a surprise from their families and wedding party! We played standard classical wedding music as guests arrived and took their seats, but the last piece before the wedding party came down the aisle was “Kashmir” by Led Zeppelin. Yes, on classical instruments! I loved the murmurs that went through the guests when they recognized what we were playing! Whether your musical tastes lean towards the classics or something totally different, I’d love to plan your wedding music with you! Along with solo harp, you have the option of choosing any size ensemble, with violin, cello, flute, piano, singers, trumpet, multiple harps, string quartet, marimba, steel drums, and more. Visit my website ~ St. Louis Wedding Musicians ~ to contact me for details! 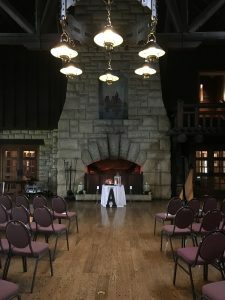 This entry was posted in Indoor Wedding Ceremonies, Weddings and tagged central illinois, ceremony, ensemble, grafton, penti, pere marquette lodge, st. louis, wedding. Bookmark the permalink.